Now, with the next legislative session approaching, there is a growing sense of urgency to address the issues that we've been talking about for many years, such as school finance, and much less attention on issues that do little more than needlessly divide voters. 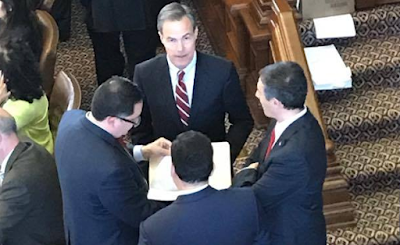 Over the past two sessions, Joe Straus has been the primary obstacle on school finance. Make no mistake: Joe Straus wanted to spend a lot of money. Joe Straus never wanted to "reform" anything. Last session, the house's 'school finance reform' proposal was HB 21. While the house sold HB 21 as a school finance bill, in reality HB 21 was a spending bill. HB 21 did nothing to provide relief to taxpayers or reduce waste in the current system. HB 21 merely attempted to pour a bunch more money into the status quo. Pouring more money into the status quo is a non-starter. Bottom Line: A more efficient system of funding public education is, potentially, a big win for taxpayers and students. For the state pick up a larger share of the total is likewise, potentially, part of that more efficient system. For that potential to materialize, however, taxpayers and students need structural reforms. Due to the nature of the his political coalition, Joe Straus was never willing to consider structural reform.